In the last post in this series, we talked about steps one and two of how to receive inner healing from rejection and abandonment. Step one was to identify the weakness in the stronghold of rejection. Step two was to forgive every person who has ever, ever, in your whole life, abandoned or rejected you, one person at a time. This must be done verbally, and it’s best done by praying out loud through every person on your list. As you pray through your list of people, forgiving everyone who has ever abandoned or rejected you, you get free by forgiving–but you get HEALED by receiving. Step three is to RECEIVE from Holy Spirit; so, today, we’re talking about HOW to receive what Holy Spirit wants to minister to you. Receiving is key, because you don’t have to try to get free alone. I wouldn’t even recommend that you try to get free alone. It’s the person that the SON sets free–the person that Jesus sets free–who is free indeed. Does that mean you wait around and hope that someday, when Jesus gets around to it, He will heal you? No; that would be ridiculous. Jesus ALREADY paid the price for you to be healed. Everything He has, and everything He has done for you, and every aspect of who He is available to you right now. All you have to do to receive it is obey His Word. True story! I think that’s a really important point to emphasize. In too many cases, Christians have gotten into this awful theology where they believe that God will bless you when He wants to; that He will deliver you when He wants to; and that He will promote you when He wants to … and that we have nothing to do with the process. The first part of that theology–the one that says God will do what He wants, when He wants–is true in some aspects; God is certainly sovereign. However, the problem is that we fail to realize that He does want to bless you in every way, right now, and He’s only waiting on you to be blessable. As soon as we obey Him and do what He’s asked us to do–e.g. forgiving those who have offended and hurt us–He meets us right where we are. You already know to obey, and the obedience part is to forgive those who have hurt you. We talked about that in the last blog post. Receiving the truth of His Word about who you are to Him, that He is with you, and that He has accepted you and loves you. Receiving these three things is not hard. All you have to do is ask Holy Spirit to help you receive, and keep on obeying His Word (especially in the aspects we’ll talk about below), and He will help you. Let’s talk about receiving truth first. … then the demonic will come back many times worse than before. Aaaaand we don’t want that. So we must receive truth first and foremost. There are several ways to receive truth, and all of them are important. First, you can–and should, need to, must–find out what God’s Word says about your situation and who you are, and speak that truth out of your mouth. Key: The Biblical meaning of the word for “faith” in the original languages actually means that you hear the truth and confess it verbally. Based on the Biblical meanings, there is no faith without verbal confession. Therefore, to truly believe something, and to build your faith, you must speak it out loud out of your mouth. Google up “Scriptures about who I am in Christ,” and read each verse you find. Speak them out loud. Google up “Scriptures about God’s love.” Again, read each verse you find and speak them out loud. Google up “Scriptures about forgiveness of sins.” Read and speak. Read through the Gospels (Matthew, Mark, Luke, and John) and the apostle Paul’s letters, especially the book of Romans. Read slowly, take notes, and meditate on what you find there about God’s mercy and who you are in Christ. Use a book such as Joyce Meyer’s The Secret Power of Speaking God’s Word (affiliate link), which has all sorts of Scriptures organized by subject that she has turned into declarations written in the first person (the “I” form). Joyce Meyer’s The Secret Power of Speaking God’s Word was one of the tools that helped me the most, early in my walk with Christ. I need to get it out again and use it regularly. (I do speak God’s Word over myself regularly, but I just haven’t been using the book.) But at that time, after I got saved, I was struggling with so many hurts and character issues, and I knew it. I was reading my Bible, and I could see that my life didn’t look at all like Papa said it should look. So I got that book, with all its Scriptural declarations. and I would pace back and forth in my kitchen and shout God’s Word over myself, loudly. Sometimes at the top of my lungs! Seriously though, decreeing God’s Word over myself made all the difference in the world. It healed my soul and helped me receive truth. The next key that will help you receive inner healing from God, and receive Holy Spirit’s ministry, is to hear the prophetic word about your exact situation. Now, there are other steps and tips below, so don’t think we’re done; but I am about to talk to you about a prophetic teaching set that I just completed, and which I’m making available to you for the very first time today. A few months ago, in July 2016, I taught a workshop called 21 Kisses: The Sure Mercies of David for Your Life. It’s the hottest prophetic word I’ve ever been given. 21 Kisses is a prophetic study of the life of David. It’s about how David was repeatedly rejected, abandoned, mistreated, and more–but God turned it around and elevated him beyond his wildest dreams. And God will do the same for you. I’ve had so much warfare over getting this word out to you. The raw power of God sat on it like I’ve never, ever experienced before in preaching. And while I was editing the audio, I actually had second thoughts about releasing it. It felt too hot to handle. Yes, 21 Kisses literally felt too hot for my spirit to handle. The fire of God burned in my spirit even while I was editing the audio, and it was almost more than I could take. Only by the compulsion of the Holy Spirit did I even decide to go through with releasing it. This word will help set you free. I believe 21 Kisses will fill you with joy, increase your faith, and release hope in you that change is coming. Please understand, this word alone will not set you free. You still have to obey God and forgive all who have hurt you. You still have to receive and confess God’s truth in place of the enemy’s lies. 21 Kisses will show you how God will annihilate the enemy’s attack on your life and turn things around for your good. For better than just your “good,” actually. Papa will turn things around for your great. For your absolute covenant blessing, abundance, and promotion. So here’s what I’ve done: I’ve made three product bundles for you. I’ll tell you about them, and then I’ll finish the rest of the teaching below. First, there’s the basic 21 Kisses MP3 set. Then, if you want tools to help you receive inner healing from the Lord, there’s the 21 Kisses and Inner Healing Superpack. The webinar replay of my 1-hour Finding Deep Soul Healing 101 recorded webinar. This webinar is no longer available, as I’m moving on to other webinar subjects. But if you don’t have it, the material from this webinar is absolutely critical to being able to find soul healing, especially from rejection and abandonment. My 17-minute podcast, no longer available anywhere else, about how to invoke your holy imagination to draw close to God and receive from Him. A sample, Biblical prayer I wrote which you can pray when you sit down to work through your list, forgive others, and receive healing from God. The prayer is for Holy Spirit’s guidance, counsel, ministry, and more. It’s powerful, and I pray it myself every time I work through an inner healing session. A sample, Biblical prayer specifically for healing from abandonment and rejection. This is an adaptation of a prayer that my Soul Healing 101 webinar attendees received, but it’s been enlarged and enhanced specifically for the healing-from-rejection process. Then, only for those who already have the Finding Deep Soul Healing 101 webinar, there is an intermediate bundle that includes everything the Superpack includes, except the webinar. I’m launching the 21 Kisses bundles today;. The launch prices, which are the cheapest prices they will ever, ever be, will be available for one week. And if you want to go wild and press into inner healing with Holy Spirit, the Superpack is a $49 value, marked down to $35 this week only. And if you already have the webinar, but you still want all the other inner healing resources, the Superpack-minus-webinar bundle is a $34 value, marked down to $24 this week only. I will leave these prices up through next Saturday, January 21. No coupon code is required. The prophetic word is so, so important as you go about the process of receiving inner healing. It will fill you with hope and lift your eyes to look up to Jesus, where you will receive better things. Now, let’s talk about receiving Holy Spirit’s comfort and healing touch. Both are essential, because they are not the same thing. What is the difference between comfort and healing? Well, comfort helps you feel better. It eases the hurt. Holy Spirit is our Comforter, and He is AMAZING at His job. He will comfort you anytime you ask. But healing comes when He touches a wound, cleans it out (which He will do as you forgive people from your heart), closes it up, and fills the wound in your spirit with Himself. Comfort calms you down and gives you peace while you’re on your way to healing. Healing fixes the wound completely and sets you free from it. When you have healed, those wounds will feel like they happened to someone else entirely. Healing sets you free because it replaces what was wounded in you with Father God Himself. You need both comfort and healing; and you can receive them simultaneously, or very nearly so. For example, if you begin praying through to forgive your father for abandoning and rejecting you, even thinking about it might open the scab over that old wound. And opening that scab can hurt. What happens when you’re sitting there alone with God, and you suddenly get overwhelmed by pain? You need comfort. You need Father’s grace and strength and comfort to be able to continue working your way through the prayer. And you pause and sit in His lap for a minute, so you can receive from Him. There’s no rush. As you fix your eyes on Jesus, a soothing balm floods over your spirit, soul, and even your body. You take a deep breath and feel peace … and you know you can go on. That’s also why it’s so important to not try to rush through a prayer of forgiveness if your heart isn’t in it. Jesus said we have to forgive from our heart in order for it to count. If you don’t mean it, sit and wait on the Holy Spirit as He ministers to you, so you can mean it. But in the situation above, let’s say you receive the comfort you need, and you continue on through the prayer. You get to the end, and you need God to heal you. What do you do? “Father God, in Jesus’ name, please heal me of all of these wounds that my earthly dad inflicted on me. Thank You for Your Holy Spirit, who lives in me and is filling me in those places right now. Abba, in Jesus’ name, I ask: in every place where I’ve been abandoned, fill me with Your manifest Presence. I know You’ll never leave me or forsake me, so fill me up and heal me in those spots and everywhere. Father God, I choose to release my dad from his obligation to father me in any way. I choose to release him right now from all my expectations. Father God, I let him go. I know my earthly dad can never fulfill my need. To receive healing, you ask God to fill you with Himself–and with every good and holy thing–in the place of the yucky, wounded stuff that was there before. And He will, every time! It helps me to invoke my holy imagination when I need to receive comfort and healing from the Lord. This is why I included my podcast about using your imagination in the 21 Kisses healing bundles above. When you learn how to invoke your holy imagination, it can take your time with the Lord, and your awareness of His presence, voice, and ministry, to a whole new level. I sit on the floor in my office. (No spiritual reason for this; I’m simply more comfortable there.) I sit against the wall, right behind the door, so the door is to my right side. And when I really, really, really need comfort, I lean right up to the door. And I imagine that, when I’m curled up against the door, that I’m actually curled up against Jesus. He’s warm and solid, and I imagine myself like a little baby, snuggled on His lap against His chest. Invoking my holy imagination builds my faith. I can see Him there, in my mind’s eye. I can hear Him. I feel like I can touch Him. I can smell His fragrance. And I can sense His arms, wrapped around me, keeping me safe. And in that place, where I’m using my imagination as a point of contact to interact with God, Holy Spirit ministers to me. As I tarry in the arms of my Lord, He comforts me. He touches me. He speaks to me. I don’t hurry. There’s no rush. It’s all about receiving from Jesus, from Father, and from Holy Spirit. If you are ready to find freedom from abandonment and rejection, and from all the hurts and wounds that go with them, you can. Turning your eyes on Jesus. You can do it. The tools I have provided above in the 21 Kisses series will help you, but even they are not essential. The essential keys to freedom are knowing that you must forgive, and understanding how the process works, and knowing that you can receive grace, help, comfort, and healing through the shed blood of Jesus Christ. Beloved Presence seeker, Father God loves you. Jesus loves you. Holy Spirit loves you. And it is Their will, and your inheritance in Christ, for you to be FREE. Will you take the steps today to be free? Will you pray through your list, one person at a time? Will you take the time to receive healing and comfort from Holy Spirit as you do? If so, then the Son will set you free, and you will be free indeed. 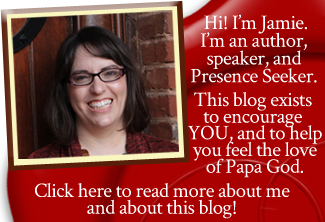 Is Holy Spirit speaking to you through this blog post? If so, please leave a comment below. He’s only waiting on you to be blessable. And blessable = obedient. Can I borrow that phrase? Sure, as long as you give proper attribution and cite the source page. Thanks as always for reading! Can 21 kisses be shipped to India? Hi Archana, all my products are digital and in downloadable form only. So yes, you can purchase any of them and download them right away. There is also a free Gumroad Library app you can use to store everything in one place. Thank you Jamie. I made the purchase. I found you on pinterest two years ago. Praise God for the way His word comes right on time through you to comfort me at moments of utter darkness and despair. Thank you so much. I’m so glad, Archana. Thank you for getting the set! I am thankful Papa has used me to bless you, and I pray He would continue to pour out His mercy and grace on you and send you help and provision for your every need. In Jesus’ name! Dear Jamie, thank you for yielding yourself to God to be used to bless us. This blog is really God’s kingdom. God is here. Thank you for the message on God’s love casts out fear, and for digging deep into the extent of our Father’s love for us. Thank you for reading, Samson. I pray Father would bless you exceedingly today, and make you perfect in His love, which does cast out every fear. I speak over you right now: Father has not given you a spirit of fear, but of POWER, LOVE, and a SOUND MIND! Please pray for me as i do this, so many many years i have struggled, please God let this work for me, I want to be free! Um. I feel like I can’t even do this right, because trying to compose such a list would literally take the rest of my life. It is a huge, unending list of people who have rejected me and I couldn’t possibly remember everyone. Yet whenever the Lord causes someone to leap to mind out of nowhere that I need to forgive, I strive to immediately, though usually not real joyfully ?this makes me feel hopeless, like I can’t even make the beginning steps to get past this. The rejection seems like it will never, ever stop and that I can’t be set free of it, or at least set free of caring so much and letting it hurt me so badly. Hi Mona. The enemy is lying to you and telling you it’s hard or impossible. But, God’s Word says it’s not too hard (Deuteronomy 30:11). The enemy is telling you these things because he wants to keep you bound. But, if you will press through and do it anyway, God will set you free. Your list may be long, but that’s okay. If you get started on it now, Holy Spirit will show you everyone to put on it–and He will set you free as you work through it and forgive every single person. My list was very long indeed … but it was worth it. I’m up to about 75 so far , within about 10 minutes. I’m sure I have a very much longer way to go. This is what I’ll start praying over now and will continue to add names and pray as the Holy Spirit brings them to mind. Ugh. Thank you my dear friend. I’m about to start now with a huge pad of paper…<>…not looking forward to this. ?